Electric clippers made for trimming dog hair are available in either rechargeable or plug-in styles. Blades sizes customize grooming to individual coats, and snap-on guide combs keep the trim even across your dog’s body. If you’re using clippers just to neaten up your dog’s feet or clean up a stray hair here or there, you’re likely to need only a set of inexpensive home clippers that won’t see a lot of use. If you want to maintain a nice show coat (or even a good pet coat) between trips to the groomer, you’re probably looking at medium-priced clippers with which you can use a variety of blades, depending on your dog’s needs. If you want to trim and style your own dog and perhaps other dogs, you’re looking at getting professional-style clippers, maybe with more than one speed and certainly with more than a few blades. Some of these clippers also are cordless, so you don’t always have to have an outlet handy. If you use cordless clippers, you may run out of battery power partway through your clipping job, depending on your speed, the job at hand, and the type of clippers. 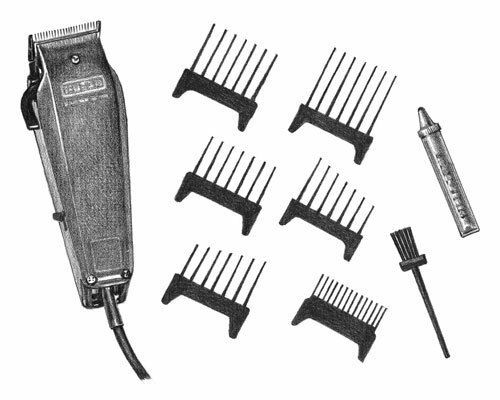 Several different manufacturers make clippers, including Oster, Andis, Conair, and Wahl among others. Oster is pretty much the leader when it comes to clippers, and almost all clipper blades — even if they’re not made by Oster — fit Oster or similar products. If your clippers don’t come with lubricating oil, be sure to pick some up to keep your clipper blades well lubricated and in tip-top working condition. Most clippers come with some type of blade, but you need other blades, depending on what type of clipping you’re doing. Blades typically are marked either by the closeness of the cut or by their Oster number (size 10, for example). You can tell how close an Oster blade cuts by the number. The higher the number, the closer or finer the cut. The lower the number, the more hair you’ll have on your dog after each clipping. So a size 40 blade (surgical cut) produces a much finer cut than a size 5 blade (1/4-inch cut). Choosing your blades is a bit of an art form and depends on your dog’s breed and coat type. Look at your breed standard and talk to other owners of your breed to determine what kinds of blades are best for your dog’s coat. Snap-on guide combs are plastic combs that you attach to your electric clippers to provide an even cut. So if you get a half-inch guide comb, you’ll get a half-inch cut. Pretty simple, isn’t it? Some guide combs come with the clippers. Others you have to buy separately.